As the boulevards are associated with Paris, Hyde Park with London and Fifth Avenue with New York City, so also is the cafe entwined with the city of Vienna. Such was the renown of the Viennese cafe, Mark Twain was moved to rapture: “that unapproachable luxury–that sumptuous coffee-house, compared with which all European coffee and all American hotel coffee is mere fluid poverty.” The cafe culture of Vienna was such that it replaced the traditional gentlemen’s clubs a good deal, and members of clubs frequented them as much as other men. According to legend, coffee was introduced to Viennese society after the Ottomans were finally expelled from its gates in the late 17th century. Leaving behind sacks of coffee, a victorious soldier, Georg Franz Kolschitzky was rewarded with them. He discovered coffee by accident, when, during his experimenting with the beans, he accidentally mixed milk with the bitter, black brew. In reality, the cafe culture originated with the Armenian Johannes Diodato, who was awarded for his spying with the monopoly on selling coffee for the period of 20 years. In 1700, four other Armenians named Isaak de Luca, Joseph Devich, Andre Ben and Philip Rudolf Perg, obtained a license to sell coffee when Diodato was accused of spying for both the Hapsburgs and the Serbians. Cafes were opened in rapid succession. In the year 1714 Vienna had 11 licensed “coffee-houses”, who found a rival in the “waterbrewers” (distillers) who sold coffee without license. In 1747 Empress Maria Theresa effectively ended the quarrel by uniting the two. By the middle of the 18th Century the basics of the café-tradition had been established. People would meet to read newspapers, play cards, have a game of billiards or just meet friends to chat. 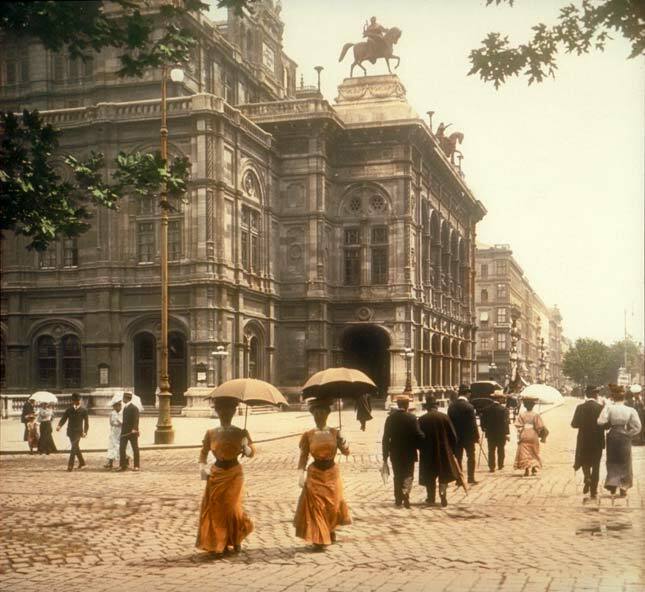 By the early 1900s, close to 500 cafes flourished in Vienna. There were so many, it was said every fifth doorway in Vienna admitted one either to an antique shop or a cafe. Like the English with their five o’clock tea, the social hour of Vienna was 4 o’clock, when the cafes would teem with so many people none but a habitué could obtain a seat. The cafes typically held two kinds of clients: “stammgäste,” or habitué’s, and the “laufende” or transients. The stammgäste, who generally spent from 3 to 4 hours every day at his cafe, were commonly called “wirthausbruder” (cafe brothers), and had tables reserved for them—woe betide any man who ventures to take possession of this sacred property! 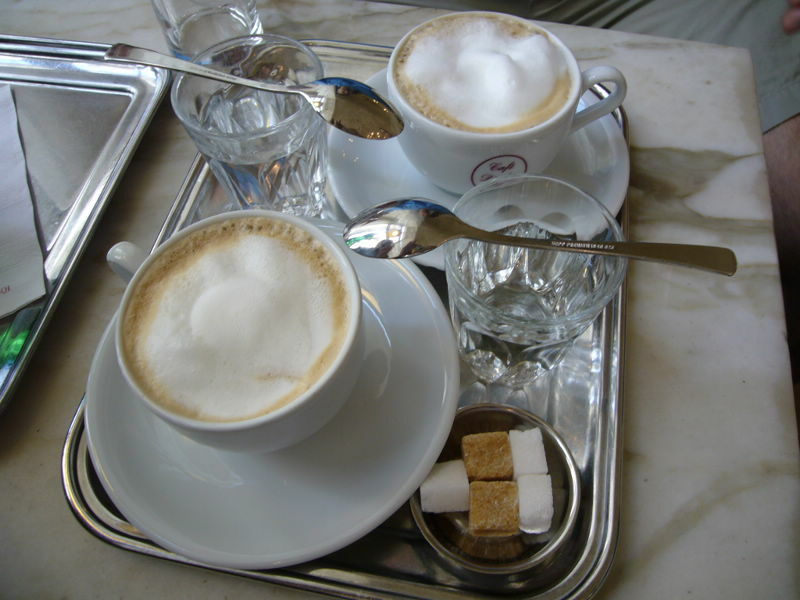 The coffee house played an important part in all the business ventures organized in Vienna. No business was performed without coffee. When visited by a fellow businessman who had some scheme to propose, they would adjourn to the nearest cafe, order coffee for two, pass a flew pleasant remarks on the weather and compliment each other on one another’s prosperous appearance. When the cups were emptied then the gentlemen took out his dainty cigarette case, offered a cigarette, and they were considered ready to handle business. The cafe was always full for they were about the only places in the city that were warm. Accordingly, on rainy days the coffee houses were filled all day long. Besides the 4 p.m. rush, the morning hours were also busy, for after breakfast businessmen were wont to drop in at their favorite cafe for an early cup before work. The early part of the evening found few loiters at the small, round tables, but later on, at 11 or 12, the theatergoers began to stream in, to drink and chat until the small hours of the night. Schwarzer. Strong black coffee. A kleiner Schwarzer is the equivalent of an espresso; a grosser Schwarzer is a double shot. Also called a Mokka. Brauner. Coffee with a dash of milk or cream. Mélange. Equal amounts of milk and coffee with froth. Kaffee Crème. Coffee with a miniature pitcher of milk on the side. Verlängter. Coffee with hot water added. Einspänner. Coffee in a glass with a hefty dollop of Schlagobers or Schlag (whipped cream). Fiaker. Espresso in a glass with sugar and Kirschwasser (a dry cherry brandy), topped with whipped cream and a cherry. Pharisäer. Espresso in a glass with sugar, whipped cream, cocoa, and a shot of rum. The cafe was there to provide much comfort to its patrons. 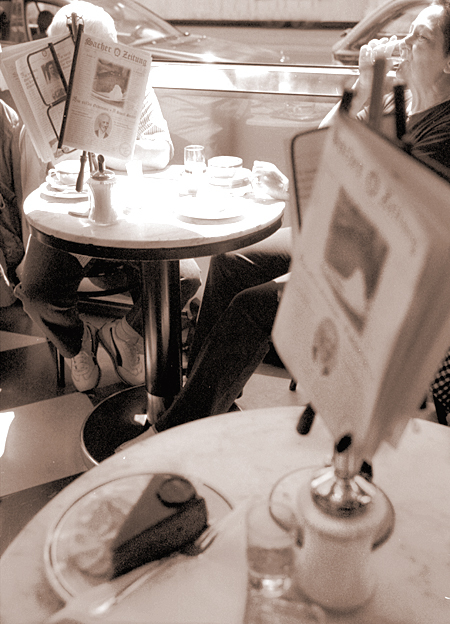 Every cafe subscribed to scores of newspapers and illustrated periodicals in all languages. In the summer the tables and chairs were moved out on the sidewalks, where, at either end were glass sides to protect the tables from the wind and, between the tables and the street, were vines trained in boxes that served to catch the dust of the traffic, and if the sun shone too brightly, an awning was unfurled. Austrian noblemen favored the cafes on the Graben and the Ring, the cafe of the National Hotel was the favorite rendezvous of pleasure seekers (actors, actresses, journalists and cocottes), and the Cafe Daum was renowned for its famous politicians, military aristocrats, statesmen and courtiers. The Hotel Sacher, which, under proprietress Anna Sacher, attracted the international set of socialites, politicians and diplomats met, housed the Cafe Sacher. It was here the Sachertorte was created, and subsequently became a Viennese delicacy. Other items native to the Viennese cafe were created by German-Austrian furniture maker Michael Thonet. In 1849 he was commissioned by the Cafe Daum to design a coat stand, and the Konsumstuhl Nr. 14, or coffee shop chair no. 14, created in 1859, won a gold medal at the 1867 Paris World’s Fair. The unique technology of wood bending heated by steam made it one of the best-selling chairs ever designed. Made of six pieces of steam-bent wood, ten screws, and two nuts it could be taken apart easily. 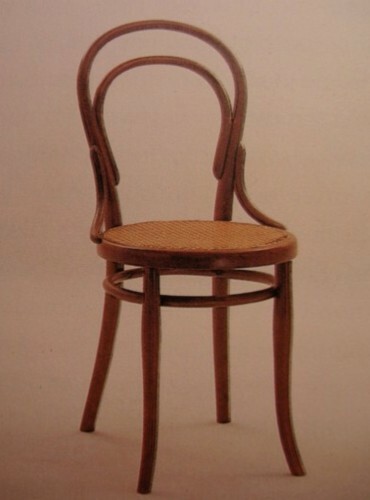 The seat would often be made out of woven cane/palm, because as this was a cafe chair the holes in the chair would let spilt liquid drain off the chair. So popular was this chair that over 15 million were sold between 1860 and 1930.